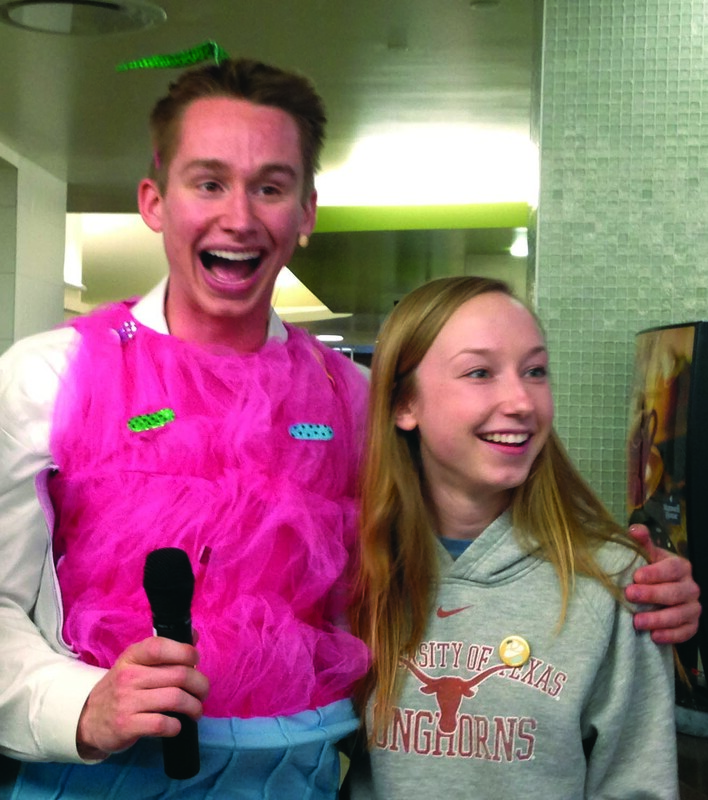 By Alyssa Brant Decked out in the iconic pink cupcake costume, the Chris Akin struts throughout the Jester second floor dining center, rallying excitement and enjoying the ability to entertain the UT-Austin student body along with supporting a good cause. Chris Akin, a marketing intern with the UT Department of Housing and Food Services, was given the frosty job by DHFS marketing coordinator Kathy Phan. 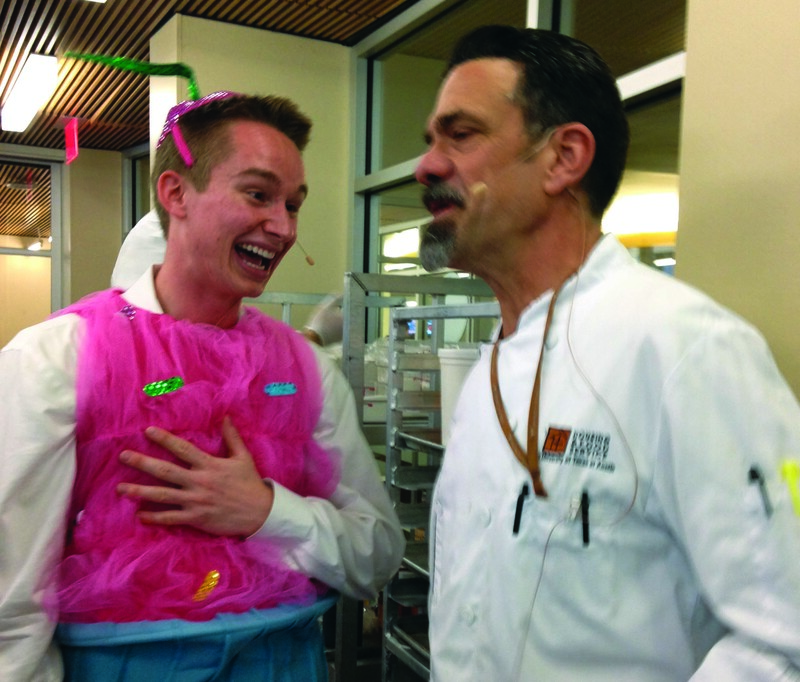 He served as the voice and host of the campus wide baking competition, Cupcake Showdown, on Feb. 27. Cupcake Showdown called on student organizations to bake a cupcake that represented their group and then submit a video explaining the uniqueness of their creation. Four finalists were then chosen to come and compete in the live bakeoff where they created a completely different cupcake from their submission incorporating mandatory ingredients selected by the DHFS. The special ingredients included pecans, honey, peaches, grapefruit, cornmeal and peppers, but the teams were not required to use every item. The four teams were Gigglepants Inprov, Texas Kappa Delta, Texas Spirits and UT National Student Speech Language Hearing Association. Each team had their own personal chef from J2 to assist them in attaining ingredients and using the kitchen appliances. The teams made everything from scratch, from the batter, to the icing, to the decorations. Part of the competition also included them arranging the cupcakes on a display in a creative manner. After one hour of intense competition, a panel of six judges evaluated their tasty works of art. Each event wouldn’t have been as successful if it wasn’t for the incorporation and enthusiasm of the Cupcake Guy mascot along and the crafty advertising by the DHFS. Last year was the first time DHFS hosted a student cooking competition. The theme was centered more around the show Iron Chef where each team had to create a four-course meal. After receiving feedback from students, the idea of a cupcake competition was suggested to make the event a stronger success than in the past. Students were able to watch the organizations bake their cupcakes live and try samples, but in addition, other activities were spread out throughout J2 to increase involvement and knowledge of the event as a whole. They incorporated a prize wheel based on baking trivia questions, a cupcake themed photo booth and a “Decorate Your Own Cupcake” bar to repeatedly establish the theme throughout the evening. Along with all the other activities, the event held a food drive to collect canned food that will be distributed to a local Austin area food bank. The winner of the competition, Texas Kappa Delta, was also awarded $1000 to donate to their charity, Girl Scouts of America. The competition had an impact on the organizations competing, but the experience also left a lasting influence upon those, like Chris, who were apart of Cupcake Showdown from the planning period.